Summertime is upon us. The hot, lazy, dog days of summer is a time most look forward to taking it easy. Allowing ourselves to rest from the hustle and rushed schedules, we hold throughout the rest of the year. It also seems to be the time, we get relaxed in our Bible studies as well. In all things there is a season. However, God’s Word is still relevant and needed in all seasons. This summer season is going to be one that we can still grow in God. At church, we have started Beth Moore’s Inheritance; which I have loving as are dig into our inheritance from God. Here at Reserved and Waiting, we are going to look at some verses over the summer months until our GROW in His Word starts back up. I hope you will join me, as we dig a bit deeper into God’s Word. Let’s get started with the theme of Rest. First we will see that God will give us rest. These summer has been a decision to rest and be intentional in my son’s life. Since my mom passed away, I have not spent the entire summer with my son. This year, I cut back on my hours at work (which like most has made me weary and burdened) to rest and take teaching moments with my son without the daily deadlines and demands that school puts on us. So far, the rewards have been over flowing. This verse is a direct invitation from Jesus, “Come to Me”. That ends with a very special promise. 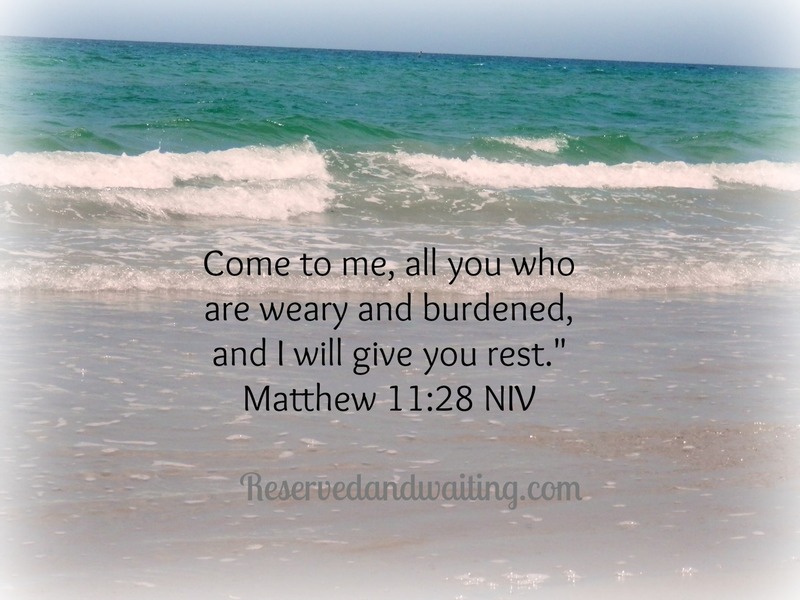 He will give you rest, just as He has promised. What about you, What are you doing this summer to find rest in our Lord?